“Begin with the end in mind.” YES. I consider Thanksgiving to be one of those great “3F” holidays: Food, Friends, and/or Family. In the last few years, we’ve taken on the cooking for Thanksgiving, a luxury of cooking-from-scratch when any other given Thursday in the year is typically spent cobbling together any old meal or leftovers for a quick post-work/school meal. These are some of the recipes that we’ll be using – or that I recommend – as a great way to fill out your table with some tasty foods to share with the ones you love. This isn’t an exhaustive list of all the options out there, and there are several items I haven’t included that will be on the table – some made by us (like mashed potatoes) and others made by family (such as squash or pumpkin pie). I just wanted to share things that I know make a really tasty table; you can supplement as you wish with the items of your choice. And, since kids are funny about food, I’ll just say that I only expect ds to eat a roll and a can of cranberry sauce. So…yeah, it’s all about knowing your audience. For those of us who are omnivorous, Thanksgiving is ALL about the turkey, and we love Cooks Illustrated’s grilled turkey recipe. There are two reasons why this is such as fantastic way to go with a turkey: 1) it produces a really moist, flavorful turkey, and 2) by using the grill, it keeps the oven free for other things! Rather than buying rolls, I decided to make my own using a recipe from the people at Fleischmann’s. Their Sour Cream Rolls are flavorful and light, and the recipe is super-easy. These rolls disappear quickly once they get to the table, and I consider that a good problem to have. I started making Stuffing a couple of years ago, and it was so tasty that (while I consistently keep blanking on taking a picture of it) I’m totally making it again. This stuffing is also totally customizable, so if you want to make it vegan or vegetarian, that’s easy as pie. 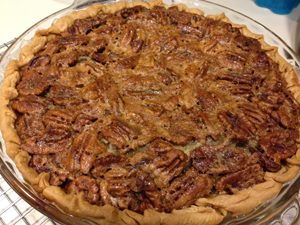 A while back, FOR SCIENCE, I tried seeing whether the idea of making a Chocolate Bourbon Pecan Pie was better than the idea of a Bourbon Pecan Pie. In my estimation, the chocolate variation is better than the non-chocolate version, but that’s also because I think chocolate goes with just about everything. No matter how you celebrate Thanksgiving, have fun – and, if at all possible, great food. In the past few months, I’ve become fairly well obsessed with avocados. 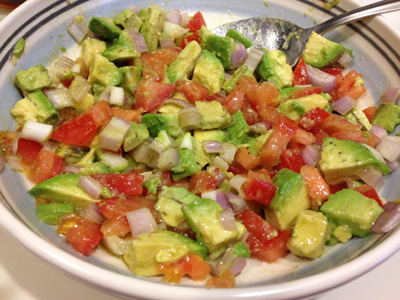 I’ve been eating them for decades, in small bites (as part of sushi rolls), but it was only in the last few years that I became a fan of guacamole and chunks of avocado in salads. Recently, when we were trying to come up with what to do with some swordfish destined for the grill, I offered to make a bruschetta. Quite a long time ago, I fell in love with a swordfish sandwich made by a now-defunct Boston restaurant, Division 16. The sandwich involved a braided roll, a thin slice of swordfish steak, and bruschetta. It fell apart as you ate it and it was just the most wonderful thing ever. That’s how my association with meaty fish and bruschetta started, and it’s a pairing I’ve enjoyed many times since. We’ve done bruschetta many times, including on scallops, which is a particular favorite of mine. So, when the question came up during my shopping trip of what to put on the swordfish, I headed straight for the avocado and vowed to try making an avocado bruschetta. It’s insanely easy, and it definitely holds its own versus the meaty swordfish (and tuna, as well). If putting this on scallops or lighter-flavored fish, I’d recommend using a smaller shallot, unless you like a lot of shallot flavor. I tend to use gargantuan shallots that grab you by the ears and shout “HELLO!” loudly in your face, and that can overpower more delicately flavored seafood. 1. Peel and dice the shallot; place it in a mixing bowl. 2. Slice open the avocado and remove the pit. 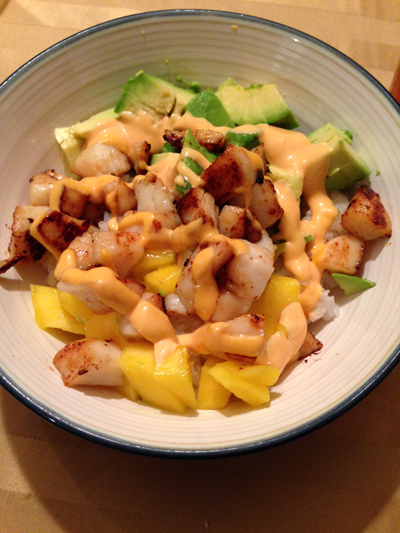 Scoop out the avocado halves in whole pieces if you can, then chop them into half-inch chunks. Add to the bowl. 3. Dice the tomato and add to the bowl. 4. Add the olive oil and lemon juice to the bowl; stir well to combine. Add salt and pepper to your taste.